Pear Tree is committed to great design and outstanding quality, which pair together splendidly in all our products. 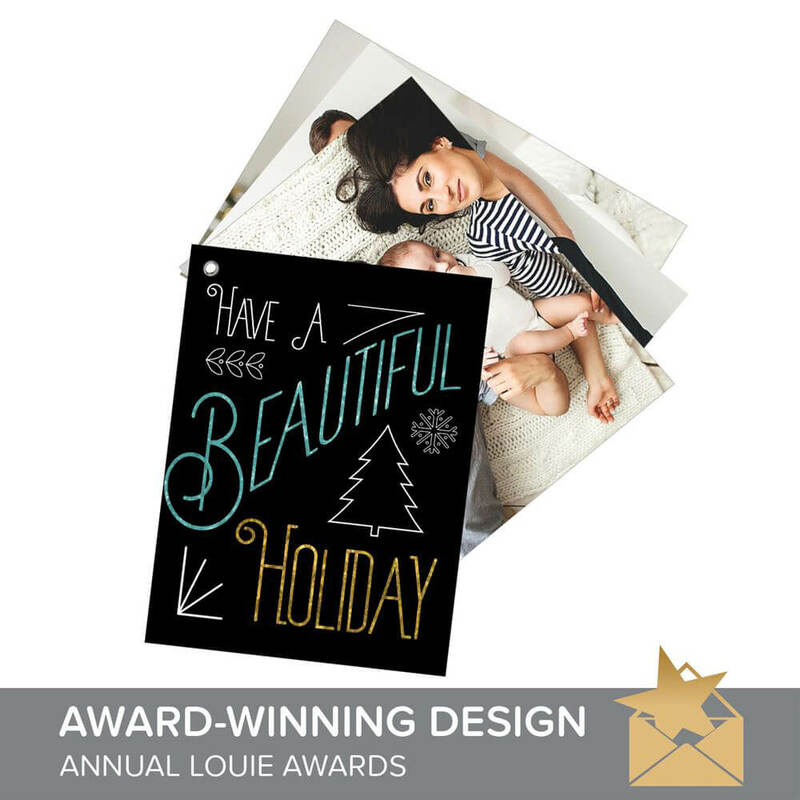 Holiday cards are the perfect marriage of our passion and values, and they are at the cornerstone of what we do. 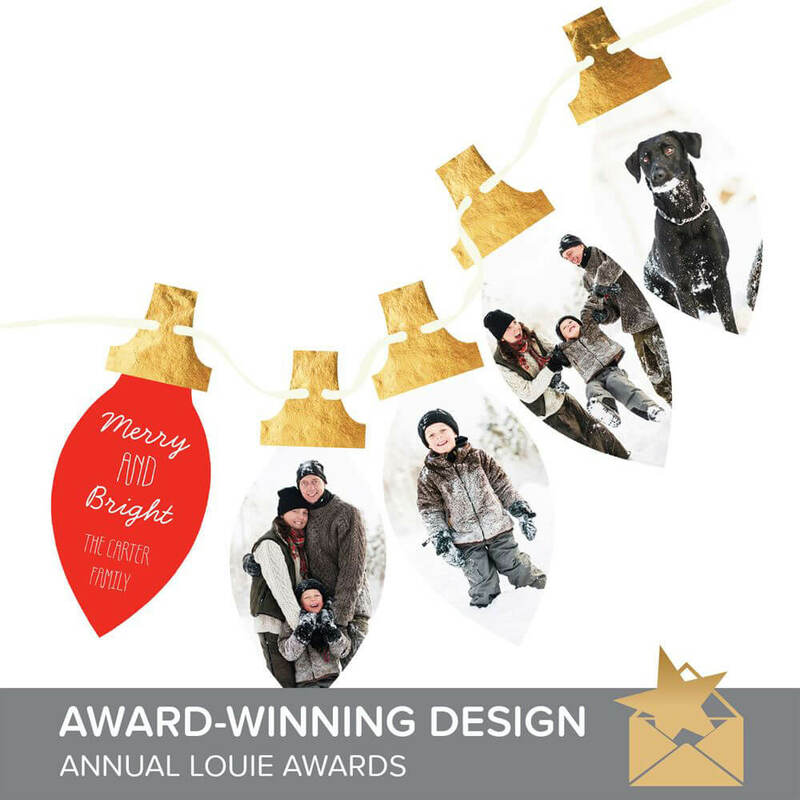 Here are just a few of our award-winning designs sure to delight everyone on your list this year. Each is worthy of celebration! One of our absolute favorites is our Swatch Book style. These innovative cards are unlike anything you’ll find elsewhere. They feature four flat cards — one with a greeting and three featuring your photos — that fan out from a grommet at the top left corner, creating a beautiful array of your pictures. We especially love the Modern Greeting Swatch Book’s contemporary design and naturalistic elements. Another fave is the Slider style card. These are such a fun twist on traditional cards that open to the left. Instead, our sliders are a pocket with a panel inside that slides out from the right. The panel holds 17 more photos, letting you tell the story of your year! 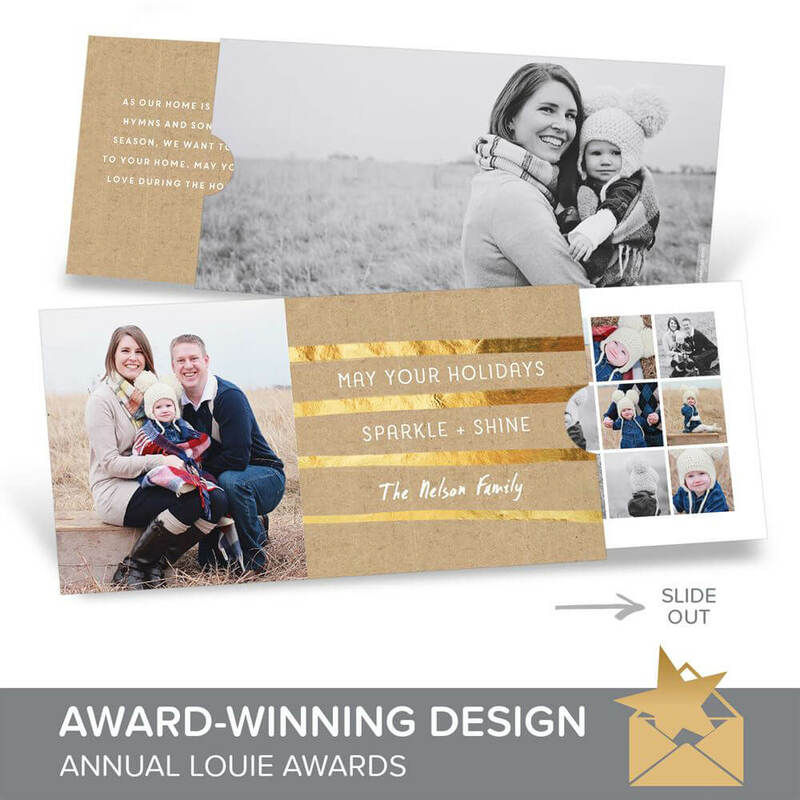 The Golden Greeting Slider is an example from our 2016 holiday collection, featuring this exciting style accented with glamorous gold foil. It will add some real pizazz to your Christmas! What could be more iconic at the holidays than old-school colorful bulbs dangling from trees and rooflines? Our design team channels this classic imagery in the utterly unique Hanging Christmas Lights card. From the innovative shape and shiny gold to the personalization options — choose two, three, or four photos! — this design will earn a special spot on everyone’s mantle. Plus, all the text is editable, letting you create a totally custom greeting. For a trendy, whimsical, and incredibly memorable design, check out the Foil Banner Hanging Card. 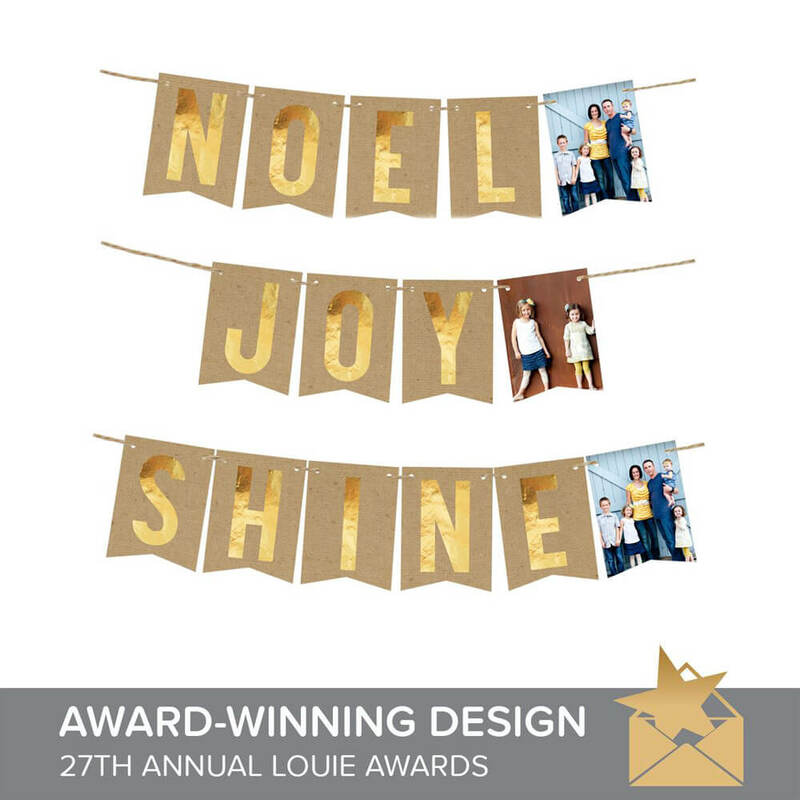 These feature faux gold foil letters spelling out one of three words — Joy, Noel, or Shine — plus one of your photos, all hanging on twine. 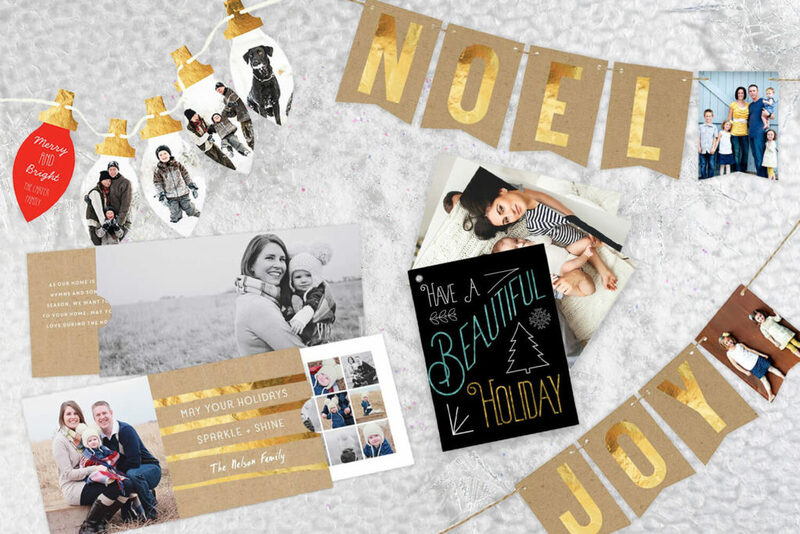 The banner style really stands out among the crowd of Christmas cards, with its totally unexpected layout pairing shiny lettering on a burlap-inspired background. It will elegantly match any decor, earning this card a well-deserved spot on display all season. Bringing you award-winning style is what motivates us all year long. We hope you love sending these designs as much as we love making them! ← PreviousTake a Peek at Our Design Process!